beckertime has no other items for sale. Sales tax may apply when shipping to: CA(7.25%), IA*, MN*, TX(8.25%), WA*. Absolutely the BEST customer service I've ever experienced on eBay. Thank you. Beckertime defines custermer service GREAT!!!!!!!!!!!!!!!!! I highly recommend this watch to collectors who are beginning their watch collection. 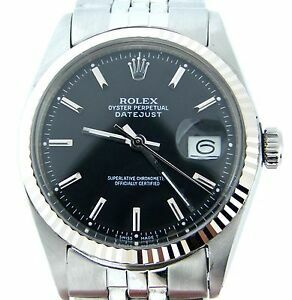 The datejust is both an iconic and classic entry level Rolex that every watch enthusiast should own. Very comfortable to wear and suggested for more formal settings in comparison to its more expensive brother the submariner which could be worn at both casual and formal settings. Datejusts are an iconic piece that can easily be indentified, so be ready for attention that the piece will bring. At 36mm the watch is perfect for small to midsize wrists as it’s a bit small in comparison to other luxury watches (hublot, audemare piguet etc.) keep in mind that all automatic watches are recommended to be serviced every 5 years and service does not come cheap and should be done by an experienced and authorized technician. Overall this is a beautiful watch to own and is easily one of my favorites. You won’t be disappointed. They asked me for my wrist size via messages and then INCLUDED, AND WELDED THE TWO ADDITONAL LINKS FOR NO CHARGE! The links currently are over 100 dollars each on Ebay.. The used watch, vintage 1977 looks like a 2018 Rolex out of the box! Dont buy from anywhere else, Pure Watches, and this review comes from an average Joe, purchasing his first Rolex, thank you. Wonderful service and care included vefore the watch was sent. Great pictures with descriptions. Decent price and it looks 1000% better in person. Beautiful watch, as advertised, well pleased. A beautiful watch as advertised, with Purewatches staff being great.